My brother Riley loves the lake as much as I do! Hi folks. It’s Shea the Puppy Relations Manager in the New York Office. My brother Riley loves the lake as much as I do! Photo by: Kathy LeistnerMy brother Riley loves the lake as much as I do! 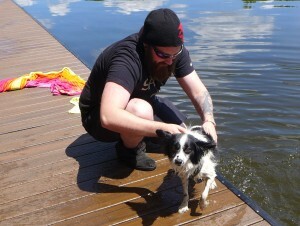 Did you know that not all dogs can swim? There are dogs that have been bred for the water, like my friend Mooch the Labrador, but some dogs might need lessons, and others like Coco the Bulldog, just can’t — ever. If your dog is hesitant about the water follow their lead, they know what they are barking about. Most dogs can be trained to swim with patience and encouragement. Ask your dog trainer or animal behavior expert for tips. I have my very own life vest, it’s bright orange, but they make them in all sizes and colors and you can buy them at major retailers like Kohl’s and or more specialized shops like WAG.com. Just because a dog’s got a vest doesn’t mean you can take your eyes off him, he can still get over-tired or snagged up. OK, your dog can swim and has a jazzy life vest like mine, but getting out of the water with a wet coat is much harder than even the hairiest human would think. Products like Scamper Ramp or Doggie Docks will help make sure that we can get out with dignity. Poolside smarts also includes remembering not to clip our nails too short because the concrete will wear them down pretty fast and watch our pads on the hot deck – they can burn. When we’re done, remember to rinse off the chlorine and dry out our ears just like you do for yourself. Oh yeah, those guys with the whistle and the orange swim suits, when they toot it twice it means no running – for anyone, even us. Running and safe-pool practice just don’t mix. Accidents happen so make a plan; know where the local vets are if you are far from home. And, unless you have special training, use a flotation device to assist a dog in trouble – even a small dog can become very difficult to manage when he is frightened in the water. And, there are many sad stories of our people drowning while trying to save us. Did you know The American Red Cross where so many human learn to swim also offers courses on Pet First Aid? Just go to RedCross.org to find a class near you. And a word about other pets, horses can swim, ferrets can swim, chickens can swim and as for you cats, I have heard of cats that can swim, but just a rare few and really only if they must. Finally, please take a look at Saving Grace a charitable organization established in the memory of Grace, a Chihuahua who sadly drowned in a family pool and dedicated to increase awareness about pets and water safety. Stay safe! Tweet me your fun-the-sun pics @PawsPR!